EON Sports VR’s SIDEKIQ VR software for football training. In the world of sports, teams are always on the lookout for new training techniques that gives them a competitive edge. 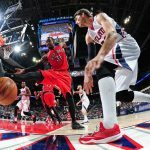 In the era of modern technology, the use of tech innovations such as virtual reality has become an increasingly cost-effective and popular way for sports teams to get that competitive edge they want. 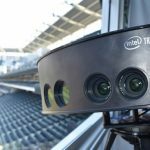 For the 2015 season of the National Football League (NFL), five teams are using virtual reality technology developed by VR tech company STRIVR Labs. These five NFL teams, namely the Cardinals, Jets, Vikings, Cowboys, and the 49ers, have been reaping the benefits of integrating VR into their training routines. 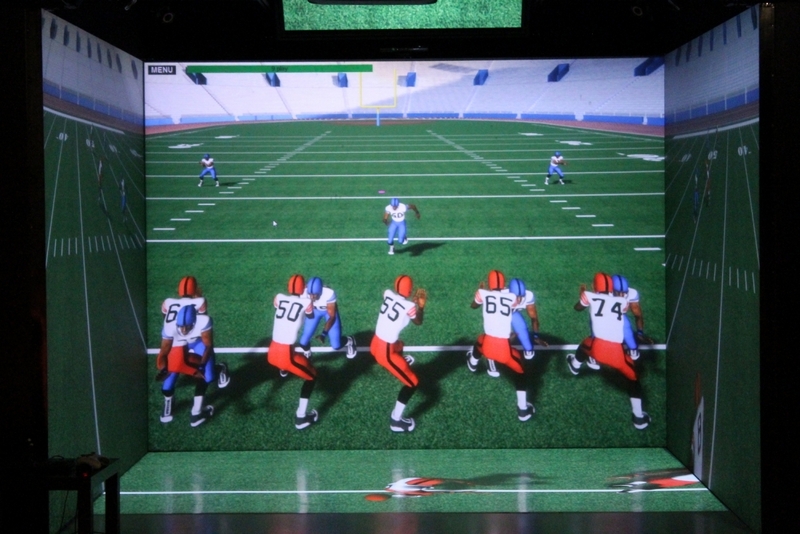 STRIVR Labs’ VR system allows players to get a different view of the action and the game field through the use of a virtual reality headset. In addition to the NFL teams, six college programs are also using STRIVR Labs’ technology. These college football teams are Stanford, Arkansas, Auburn, Clemson, Dartmouth and Vanderbilt. STRIVR Labs’ Co-founder Derek Belch, wearing an Oculus Rift for a VR demo. 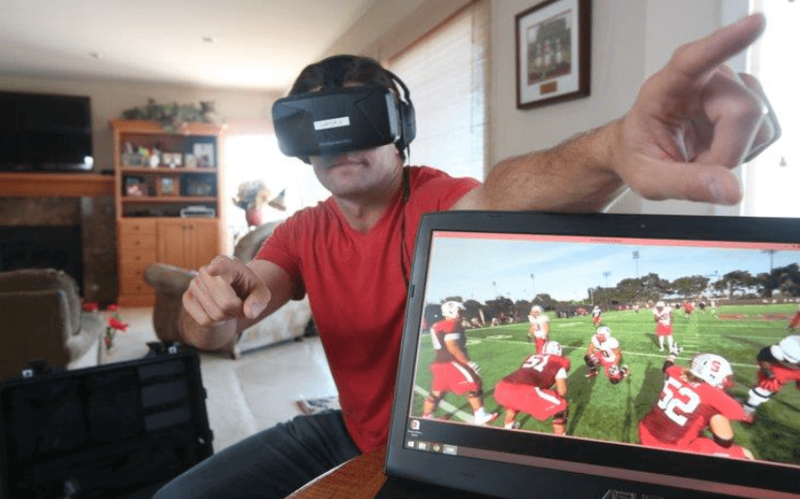 STRIVR Labs co-founder Derek Belch was once a player for Stanford University and first-handedly tested this application of VR on the Stanford football team during the 2014 season. 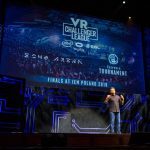 Although STRIVR Labs’ VR system is still in its infancy, the VR company is looking on the possibility of making the system available for fans so that they can have a perspective of the game as if they were the player themselves. 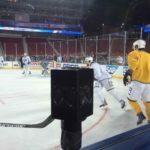 Aside from STRIVR Labs, another VR company is helping the college football teams of the University of Kansas, University of Mississippi, and UCLA to complement their intensive training regimen with VR technology. EON Sports VR, a company specializing in VR software for sports performance training, made ties with these universities for the SIDEKIQ football simulation software. The SIDEKIQ, paired with the Oculus Rift VR headset, helps the quarterbacks prepare for the upcoming football season. Having a wide array of customization options for every game scenario, SIDEKIQ allows coaches to make strategies for defensive and offensive plays that the quarterbacks will experience during the training simulation. VR in sports training is expensive – EON Sports VR’s SIDEKIQ costs from $2,000 to a cool $10,000 for the basic package. Premium versions of the hardware and software – which can use real-life footage – sell for as much as $35,000. 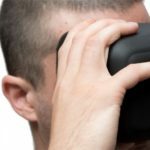 The use of VR in sports training isn’t limited to the Oculus Rift – a smartphone app can be used along with a portable pair of VR goggles, such as the Google Cardboard, that allows quarterbacks to see replays of their training anywhere. The 2015 college football season officially begins on September 3.